It happens when you least expect it. You are walking through a public space, maybe a park, a drab government building, or even a store, and suddenly something slightly out of the ordinary catches your eye. There among the mundane surroundings is an unforeseen tidbit of aesthetic design. The discovery of art in an unanticipated place surprised me on a recent trip to the public library to grab a good read. I was on a quest for words, not visual art, but it turns out art is exactly what I got. Experiencing public art constitutes a much different experience than that of walking into a museum or gallery where the viewer is actively seeking out artistic expression, perhaps sporting a serious look in preparation to ponder aesthetics. On the other hand, when casually strolling through a public space, not seeking or expecting to see art, one’s reaction is undoubtedly more spontaneous and more raw. Art outside of a gallery setting is surprising and engages random passersby in creative conversation. That is truly the beauty of public art -- available to everyone, at anytime, and more often than not in the place where you least expect to find it. 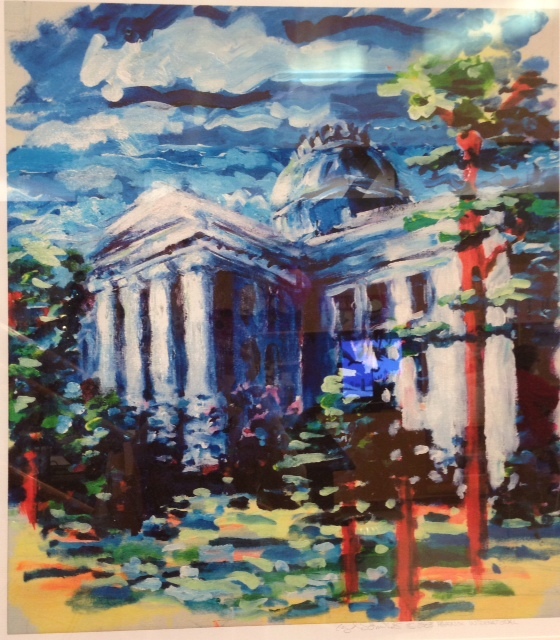 The Wake County Public Libraries help make visual art accessible to all individuals. The Cameron Village Regional Library, in particular, cycles through new art exhibitions about once a month. Local artists are invited to submit works directly to library staff members, who then select pieces on an individual basis. Artists are also sought out by library staff members who often see artists’ work at other venues around Raleigh or hear about their craft through word-of-mouth. Last year, the library put out a call-to-artists through the Visual Art Exchange, a non-commercial gallery for emerging artists located in downtown Raleigh. The monthly rotations and open artist calls mean the library’s art remains fresh, allowing patrons to experience new visuals and providing many local artists an opportunity to showcase their work in a highly trafficked public setting. The sculptures currently inhabiting the Cameron Village Library are an exception to the monthly art rotation. A few of the pieces are permanent acquisitions. 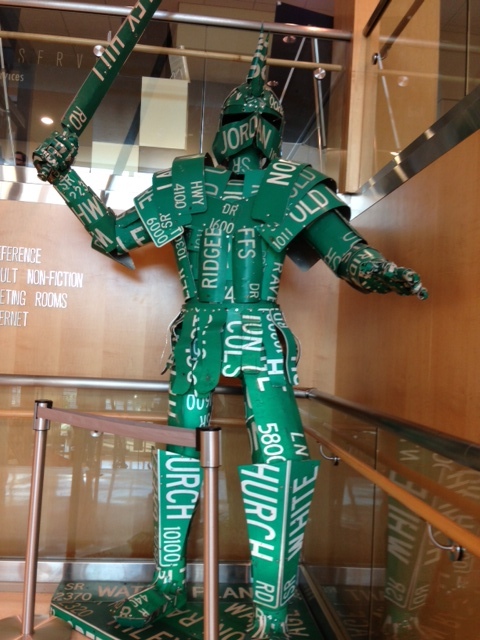 Immediately upon entering the sliding glass doors of the library, guests are confronted by a massive knight in reflective armor made completely from classic, green Raleigh street signs. The 12-foot-tall Street Knight towers over you from the winding staircase above and is both visually impressive and humorous. The knight’s creator, Joseph Carnivale, has been a local celebrity ever since his Barrel Monster antics went viral throughout Raleigh back in 2009. 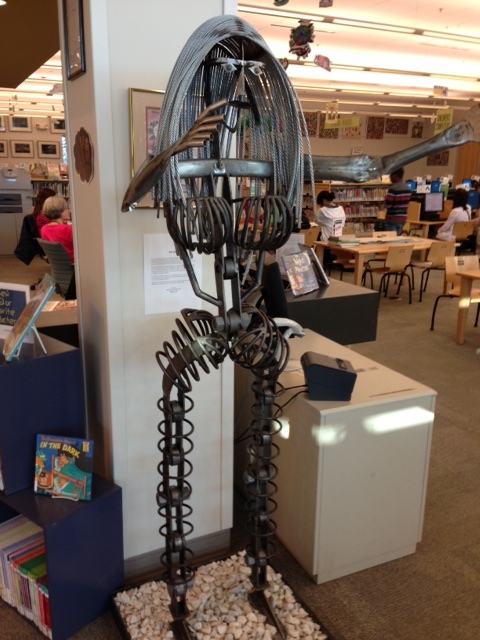 This particular knight made the library his permanent home after Carnivale won the Scrap to Sculpture art contest hosted by Cameron Village. Real estate firm York Properties bought the sculpture, made entirely from found recycled objects, at an auction and donated it to the Cameron Village Library to be enjoyed by the community for years to come. Other sculptural wonders adorning the space include four life-size figures that seesaw the line between human and machine. The substantial female figures are both sensual and intimidating, made from recycled metal machinery. They are creations of local artist Ben Harris whose passion to create was sparked while working at a L.A. machine shop in 1976. After seeing great quantities of scrap metal go to waste, Harris began collecting the excess material and rendering them into massive human forms. After moving back to N.C. and taking a job at Clancy and Theys Construction Company, Harris continues to collect discarded materials and recycle them into creations of welded metal. Whether you are a bookworm or an art fanatic, Cameron Village Public Library is the spot for a Creative Genius. Hours of operation can be found here.